Online Prayer and Petitions - Need Prayer? NeedPrayer.Com is a ministry project of a small group of Christians in Tampa, Florida. This project is completely funded and operated by the group, their families, and its network of volunteer Prayer Partners. We do not solicit funds nor accept donations for this project at this time. We also value your privacy and do not sell or distribute your e-mail address or contact information to any outside agencies. We just want to pray with you and help you get closer to God. Welcome to NeedPrayer.Com. Please choose the reason for which you are visiting this website from the options below. 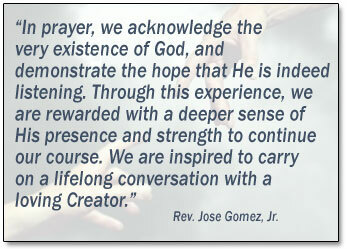 Access our online Prayer Form and broadcast your prayer request to our network of Prayer Partners. Join our worldwide Prayer Network and receive prayer requests submitted through this website. Learn more about this site, the people behind it, what we believe about prayer, and use our MP3 Bible! Learn more about who God is and how He works to mold you into what you were destined to become.